"Nice place , needs some updating , great views and nice frie..."
Have a question for Camiguin Island Golden Sunset Beach Club? "Sea view rooms - your balcony sits right in front of the beach!" Offering quality accommodations in the romance, sightseeing, beaches district of Camiguin, Camiguin Island Golden Sunset Beach Club is a popular pick for both business and leisure travelers. From here, guests can enjoy easy access to all that the lively city has to offer. This modern hotel is in the vicinity of popular city attractions such as White Island, The Sunken Cemetery, Camiguin Airport. At Camiguin Island Golden Sunset Beach Club, every effort is made to make guests feel comfortable. To do so, the hotel provides the best in services and amenities. The hotel offers access to a vast array of services, including free Wi-Fi in all rooms, facilities for disabled guests, Wi-Fi in public areas, car park, room service. 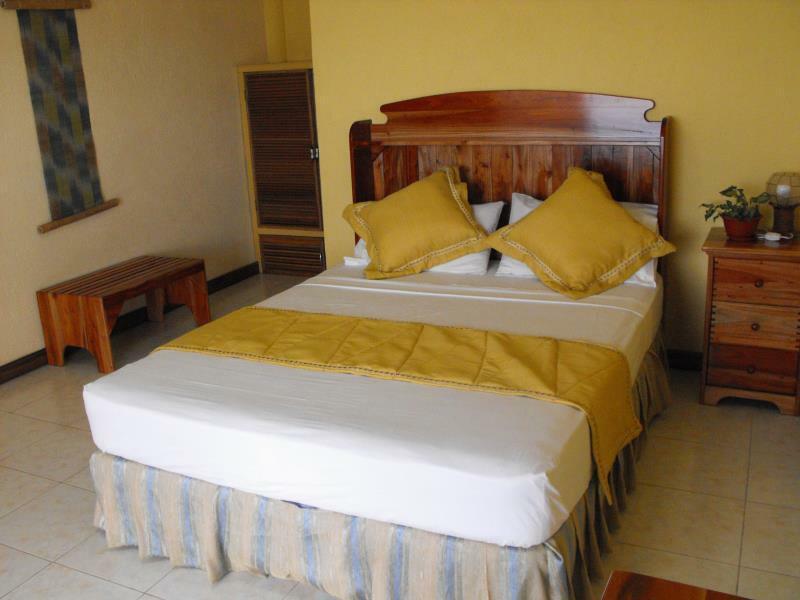 The ambiance of Camiguin Island Golden Sunset Beach Club is reflected in every guestroom. internet access – wireless, internet access – wireless (complimentary), non smoking rooms, air conditioning, balcony/terrace are just some of the facilities that can be found throughout the property. The complete list of recreational facilities is available at the hotel, including private beach, outdoor pool, massage, pool (kids), tennis courts. When you are looking for comfortable and convenient accommodations in Camiguin, make Camiguin Island Golden Sunset Beach Club your home away from home. "The Golden Sunset Beach Club on Camiguin Island is an older,..."
The stuff was friendly and try to give his best. The swimming pool you can not use. Is milky and not really clean. Also early morning the stuff make a lot of noice and loud music. It was not good on a so quit place where you can sleep long. The Night Guard move the chairs on the terraces at night. It was on the top of our bed and make a lot of noice. But all in all for the price was ok. Loved the food. Loved the room. Loved the staff. Loved the pool. Loved the view. Loved the dog. Such an intimate experience. After traveling to Malapascua and Bantayan we saved Camiguin for our finale. Somethings are meant to be. Camiguin possesses a unique vibe that is hard to express in words. Staying at this property enhanced the experience. Thanks to the staff for all their advice, help and kindness. Staff is lazy and not helpful at all. We had to ask them every day to clean the room, if not they wouldn't bother. Every day at the restaurant, we ended up getting up to order directly at the kitchen because nobody was paying attention to customers. Despite having a paid reservation via Agoda the resort gave away my room to another guest. Staff couldn't find my booking despite showing them email confirmation Agoda. They offered to billet me in a bigger but was really ugly and also not ready for occupancy (this was at 530pm already). The only brightside was that they gave me my cash refund on the spot. I was very hesitant to book for a hotel in this island ahead of time because I have no idea of its location. However, i did not went wrong booking along Mambajao and this resort. It is close to everything. This resort is homey and felt like inside my own bedroom. Thumbs up to housekeeping, seeing us had our bfast, they immediately clean the room. The food is okay and I believe they tried hard to make our stay worthwhile. When we arrive the place we were greeted by owners, a Filipina wife and an English Husband. The place is just perfect a location and our room had an excellent view of the ocean, I could see the White Island in the horizon. The staff are so nice and very helpful. They can arrange any transportation and tours. I would definitely stay here when I come back in Camiguin! It's a nice little resort looking out to White Island. Stayed there low season so it was nice and quiet. Wifi is good in the restaurant area (very close to the rooms), food is good, pool is large, bed is comfortable and air con is decent. It's exactly what you need for staying in a place like Camiguin as you are not in your room during the day. I would definitely stay here again. great little resort. Nice location close to airport and white beach and decent pool, but the rooms are really showing their age. Breakfast was ok nothing more and meals were average also (apart from the one with a hair in it). Ive stayed in far better for a similiar price just a few days ago in Coron so for what it is, I think its overpriced. The place is very far from the port. You need to hire a multicab going here. Travel time from here to benoni port is around 1hr. But if you're going to white island, paras port is just walking distance. Room is very basic but big. No hot water in the shower. No wifi signal inside the rooms. The staff are friendly and they can accommodate your request. Breakfast is plain but other food are good and affordable. 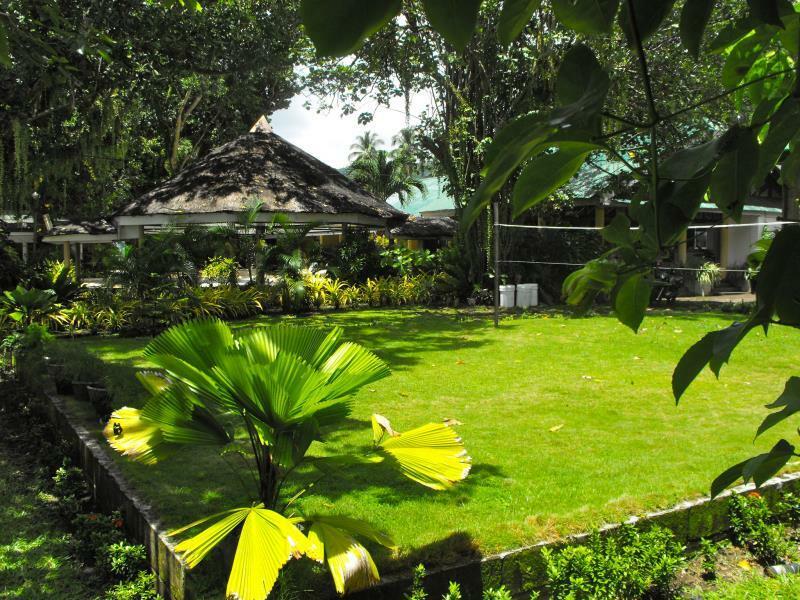 The Golden Sunset Beach Club on Camiguin Island is an older, small rustic property right on the beach, nestled under the massive canopy of magnificent old trees. The staff is friendly without being fake. I like that. The menu is limited, but what they offer they do well. They have a well stocked bar, but beer seems to be limited to local beer only, San Mig Lite and San Miguel Pale Pilsen were all I recall seeing. They lose points for not having Red Horse, but they get points for having ice cold beer and a frosted mug. Rooms are reasonably priced but limited. Maybe there are 10-15 rooms in the entire resort. Our room was massive with nothing but ocean outside the patio window. It was clean enough but don't expect a finely manicured resort. This place has a few rough edges, there are dogs around and if it rains you can expect some of the pathways to be flooded. Great value, nice place! this resort has beach front and a very nice sunset view which can be seen either inside the room or at the balcony. location is excellent, 15 min from the airport and few minutes from the boat to white island. but the pool is dirty. The room is clean and has basic needs. You might have water interruption. The staff are very accommodating. Overall this resort is very good if you want a quiet relaxing with a beautiful view to enjoy.